Drawing tablets long before the invention of drawing tablets, artists and other professionals in the drawing arena used to display their artwork on pieces of papers using pencils. For artists, you had to buy a variety of different pencils with varying thickness and paints to use when applying color to your drawings. Now, what if something went wrong with the art? Here, the only solution was to abandon the drawing and start all over again. With such challenges in mind, I will definitely admit that early artists had a tough time when drawing. Aside from the traditional hassle, today’s advancement in technology has made things much easier for drawing professionals thanks to the introduction of the best drawing tablets. These easy to use computer hardware have really revolutionized the way we compose art thanks to a set of innovative tools and advanced features. Although it all started with the invention of smart drawing software such as Adobe Illustrator and Photoshop, drawing tablets gained popularity really fast as the use of keyboards and mouse failed a lot in delivering accuracy. What Really is a Drawing Tablet? Also referred to as a pen tablet, a drawing tablet is a flat computer hardware that allows artists or other users to sketch images using a stylus. When an image is drawn, the tablet captures it as data sending it to a motor where it’s displayed. According to professional artists, this technology is far much better than using an ordinary mouse plus a keyword which are considered to be less accurate and time-consuming. When operating a drawing tablet, the first action you take is to attach it to your computer using a USB cable. When a drawing is made, the tablet automatically generates a signal which is sent to the monitor for display. This fast action is the main reason why drawing tablets are hugely considered in most fields that rely on drawing and sketching. Where are Drawing Tablets Usable? Professional fields such as in engineering, design, and architecture have hugely turned to the use of drawing tablets as they’re more natural to hold and use as compared to mouse and keyboards. This makes it easier for them to record measurements and make complex calculations digitally without having to do it on paper. In the healthcare industry, drawing tablets are highly usable in writing and saving a patient’s medical records. They’re also highly usable when prescribing a particular medication for a patient. The best thing is that data is automatically saved in the hospital’s database for future reference. In the field of education, teachers and lecturers use drawing tablets alongside computers and projectors to demonstrate various techniques. If topics incorporate the use of graphs, pie charts, and other diagrams, these computer hardware devices will be highly usable. In the business sector, drawing tablets are hugely preferred by professionals in demonstrating their products and services during marketing presentations. Illustrators, photographers, and animators have found drawing tablets to be relatively useful in their fields. By just picking up a pen and making drawings directly on flat tablets, such people have really advanced their skills and progressed immensely all thanks to the drawing tablets. When you’re planning to buy the best drawing tablets, there are those key specifications you‘ll need to consider before parting with your money. Since the market has been overwhelmed with multiple options to choose from, this section will highlight several things you’ll need to factor in before choosing your best drawing tablet. The first factor you need to check when choosing a drawing tablet is the size. You see, a tablet with a large drawing area will definitely provide you with ample space to make your drawings thus enhancing efficiency. Another factor you need to consider is pressure sensitivity. Depending on the drawing tablet brand, most drawing tablets have pressure sensitivities that render thicker or slimmer lines depending on the pressure applied. This gives you the simplicity of making sketches thicker or thinner by just applying or relieving pressure when drawing. Finally, there’s the issue of simplicity. Here, you need to consider the programmable controls and how easy they are when making drawings. Some drawing tablet models include the control keys on the pen while in others, the functional keys are in the drawing tablet itself. Depending on your needs, it’s paramount that you choose the best model that will work for you. If you’re a beginner in the world of drawing tablets, I believe you must be struggling to differentiate between a drawing tablet and a graphics tablet. Now, although these two gadgets perform a relatively similar task in the digital artwork arena, there’s a slight difference between the two which keeps them apart from each other. First, let me admit that the names of these two drawing tablet gadgets are mostly used interchangeably. Sometimes they’re called drawing tablets, sometimes, graphics tablets and other times pen tablets or digitizers. Although they’re similar in so many aspects, the main difference is with the display. Drawing tablets are similar to monitors and come with a display that reveals whatever you’re drawing while graphic tablets only have an active area where you perform your drawing tasks. Graphics tablets must be connected to the monitor to give you a clear view of whatever you’re doing. A roundup review of the best drawing tablets Now, having highlighted everything you need to know about drawing tablets, this post will now review some of the best models you can choose for your drawing endeavors. Let’s find them out. Our first best drawing tablet. Are you a professional animator, illustrator or photographer searching for the perfect way of displaying your work of art? Well, the Huion GT-220 is the best drawing tablet to consider. Available in a massive 21.5” LCD HD IPS monitor, this drawing tablet offers you the perfect resolution of 1920×1080, a viewing angle of 178° and an aspect ratio of 16:9. When it comes to giving you the best drawing experience, the Huion GT-220 offers you a pen pressure of 8192 levels for added accuracy and precision and has a firmware update that improves performance on a daily basis. This drawing tablet is compatible with Windows and iOS operating systems such as Windows 7, 8, 8.1 and 10 as well as Mac 10.8.0 and higher. Designed with a rechargeable pen that operates for 350 hours, a 1-year warranty plus other gifts, the Huion GT-220 is exactly what you need to accomplish your drawing tasks. Features: one feature that sets the Huion GT-220 apart from other drawing tablets is the ability to support various drawing software. Such programs which include; Photoshop, Corel Painter, Autodesk Sketchbook, Manga Studio, Illustrator, Zbrush and more are highly usable for both armature and professional animators and photographers when accomplishing their drawing tasks. Something else about this tablet, the Huion GT-220 is the wide 21.5” HD display. With such a wide display and a super sharp resolution of 1920×1080, users will have a wide display to accomplish various drawing tasks while still accessing the control panel easily. We all have different tastes when it comes to the Operating Systems. When using the Huion GT-220, users will have the freedom of using the most popular OS versions such as Windows 7, 8, 8.1 and 10 as well as Mac 10.8.0 and above. If you’re not comfortable using the Huion GT-220 while laying flat on the table, then you have the option of using a stand which can be adjusted with different angles to suit your best working position. Pros: The Huion GT-220 has an upgraded pen pressure sensitivity that has really advanced its performance in terms of precision, accuracy and smoothness. Setting up the Huion GT-220 is quite easy as it requires you to connect it to the monitor, set up the working area and get ready to roll. Since the tablet is quite large, you don’t need to move it every now and then. Unlike most models that feature battery-powered pens, the Huion GT-220 comes with a more advanced rechargeable pen that offers up to 350 hours of continuous use with just a one and a half recharge time. If you’re a drawing enthusiast, there’s something to smile about as this drawing tablet supports all major drawing software such as Photoshop, Corel Painter, Autodesk Sketchbook, Manga Studio, Illustrator, Zbrush and GIMP among others. Cons: With a screen size of 21.5”, most users have found this to be extremely cumbersome and too bulky to carry from location to another. If you’re an architect or a construction engineer, this drawing tablet will not suit you especially when it comes to carrying it around. Another issue we can’t fail to point out is with the pen. The buttons are easy to bump into causing you to compromise with your work when drawing is in progress. Overall, the Huion GT-220 is one of the best drawing tablets suited for those people who don’t move a lot. This tablet featuring an elegant and lightweight design, this drawing tablet is easy to adjust, easy to use and perfect when it comes to supporting various versions of Mac and Windows operating systems. Welcomed with high ratings from the majority of online customers, the Huion GT-220 is what you need to advance your drawing skills. The Ugee M708 Drawing Tablet is one of the best tablets every aspiring graphics designer must have. Available at an affordable price, this drawing tablet is exactly what beginners or students in the graphics arena should consider especially due to its simple-to-operate user interface. Unlike the large Huion GT-220, the Ugee M708 Drawing Tablet is extremely light and sleek making it a perfect option for professionals on the go. This tablet has a wide 10”×6” working area, 8-hotkeys to customize your work, and a super sensitive pen with 2048 pressure levels. Compatible with most popular Windows and Mac operating systems, the Ugee M708 Drawing Tablet is a must have for any armature and professional graphic designer out there. Features: it’s one critical factor every customer must consider. Having recognized this factor, Ugee has managed to design the Ugee M708 Drawing Tablet with a light weight of just 1.27 pounds and dimensions of 8.3×14.1×0.3 inches making it extremely sleek you elegant. Speaking of the performance, you can take advantage of the 8 hotkeys which will help you customize your drawing according to your preference. Among these functions include; the erase, brush tool, hand tool, brush enhance/weaken, cancel as well as zoom in/out. How much do you love drawing? If you’re a drawing maniac or you enjoy getting to your drawing limits, the Ugee M708 Drawing Tablet will let you access some of the best drawing software such as; the Adobe Photoshop, Illustrator, Autodesk MAYA, Zbrush and Corel Painter among others. Pros: The Ugee M708 Drawing Tablet is designed with a pressure sensitivity level of 2048. With such high-pressure sensitivity, users will have an easy time drawing, writing or signing on the tablet as everything runs out smoothly. Unlike most competing tablets, the Ugee M708 Drawing Tablet is extremely light and sleek making it a perfect option for busy professionals. Its light weight means that you can use it both for office work or field study. Are you a left or right-handed drawing expert? Well, the Ugee M708 Drawing Tablet is designed just for you. This tablet can suit both right and left-handed users making it more versatile as compared to most of its competitors. Speaking of the working area, the Ugee M708 Drawing Tablet has a large working area of 10×6 inches. This, alongside a 5080LPI resolution and a 230 RPS report rate are enough to give you a wide, clear and uninterrupted working area to accomplish your drawing tasks. This drawing tablet is compatible with popular operating systems such as Windows XP/Vista/7/8/10 and Mac OS. Therefore, if you’re looking forward to accomplishing your drawing tasks on a PC running any of these operating systems, then there’s nothing to worry about. Cons: The Ugee M708 Drawing Tablet has a tendency of losing some programs. Now, to restore them back, you need to uninstall all the drivers then re-install them again. According to most users, this process is very difficult and challenging especially if you’re a beginner. Overall, the Ugee M708 Drawing Tablet is the best tablet for those beginners aspiring to become expert graphic designers without digging deep into their pockets. This equipment is sleek, light and extremely easy to carry anywhere you go. It’s compatible with most operating systems and major drawing software meaning you can use it anywhere and anytime depending on your needs. Are you planning to transition from the traditional paper plus pencil to the more digitally advanced computer-based artwork? Well, you can easily achieve this with the help of a reliable computer hardware such as the HONGYETAJA Wacom CTL472 Tablet. Released just recently, this tablet will allow you to have some fun thanks to some advanced features. To start off, this drawing tablet has a light weight of just 9.1 ounces and sleek dimensions of 8.3×5.7×0.3 inches. It has an active area of 6.0×3.7 inches giving you enough space to draw and customize your work to meet your needs. Its resolution of 2540lpi, a maximum data rate of 133 RPS and pen pressure levels of 2048 are some of the most outstanding features you can’t miss to experience with the HONGYETAJA Wacom CTL472 Tablet. Features: it’s a very simplified tablet that will let you roll and roll without facing any challenges. You can draw, paint and write using the digital pen without feeling too limited or uncomfortable. The battery-free pen is an added advantage as it makes your drawing more accurate as compared to a mouse. You can opt to apply pressure or release it to draw thick or thin lines thus simplifying everything up for you. Apart from what we’ve already mentioned, the HONGYETAJA Wacom CTL472 Tablet is compatible with popular operating systems such as the latest Windows OS (from Win. 7) and Mac OS X 10.10 and above. Pros: The HONGYETAJA Wacom CTL472 Tablet is very easy to use. With the help of the bamboo digital pen, this tablet will give you a natural experience in a more digitized way. 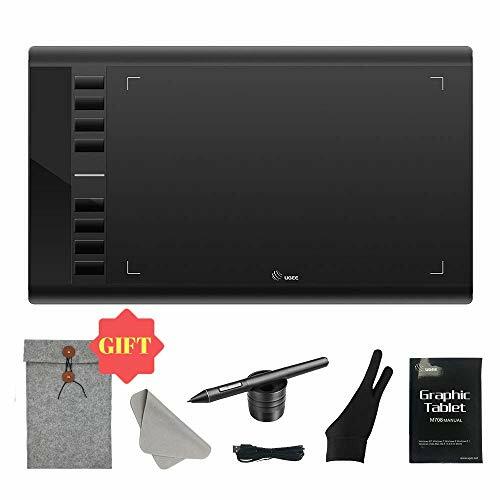 This drawing tablet comes with all the necessary components such as 3 replaceable nibs (for the pen), a USB cable, a nib removal tool and a detailed start guide for beginners to utilize. Apart from being light and sleek enough to carry almost anywhere, the HONGYETAJA Wacom CTL472 Tablet has a wide working area that lets you draw, paint, and write on without running out of space. Finally, this drawing tablet allows you to draw smoothly and naturally while replicating pencils, chalks, oils and other drawing materials. Like it’s not enough, you can also share your creative drawings digitally with friends and family. Cons: One limitation of the HONGYETAJA Wacom CTL472 Tablet is that it doesn’t have most of the cool features we’ve seen with other drawing tablets. It’s actually too binary making it ideal for beginners but not professionals. Do you draw just for fun or are you an aspiring graphic designer? Well, the answer lies in the HONGYETAJA Wacom CTL472 Tablet. A sleek, light and extremely easy to use tablet, the HONGYETAJA Wacom CTL472 Tablet is the perfect alternative for users looking forward to exploring their drawing interests while enjoying the premium feel of this exclusive gadget. Are you a graphic design professional or just an armature aspiring to become an expert? The best way of being certain with your career is to add the XP-Pen SatrG640 Drawing Tablet right in your Wishlist. Unlike the HONGYETAJA Wacom CTL472 Tablet, the XP-Pen SatrG640 Drawing Tablet is more concise, more advanced and more feature-packed making it a premium choice for most graphic designers. Having replaced the traditional mouse, the XP-Pen SatrG640 Drawing Tablet is sleek and fairly rough on the surface making it easier for the pen to slide smoothly when drawing, painting or signing signatures. The top section is quite thick to fit all the electronics inside while the pen is battery –free meaning you’ll have more hours of making incredible drawings. Features: unlike its former predecessors, the XP-Pen SatrG640 Drawing Tablet is thinner (2mm) and wider (6×4 inches) giving you ample space to work on. Sleek and very light (13.1 ounces), you’ll definitely have a chance to take this tablet anywhere to suit your gaming and drawing lifestyle. The pen itself is designed with an incredible passive electromagnetic technology that eliminates the use of batteries or need to recharge. This makes the PO1 pen surprisingly ergonomic and easy to use considering it has 20 replaceable nibs. 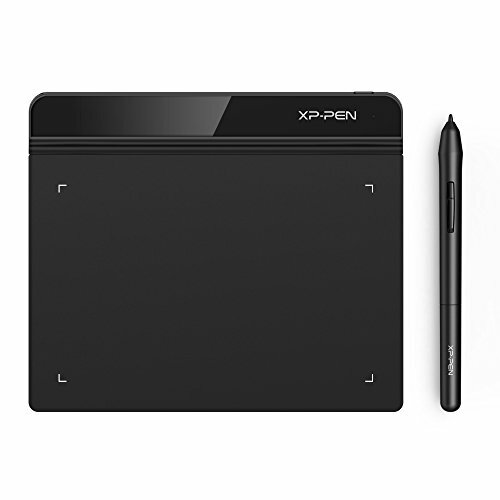 The XP-Pen SatrG640 Drawing Tablet is more accurate and fast when drawing thanks to the pressure sensitivity of 8192 levels and a report rate of 266 RPS. To give you a more advanced user experience, the XP-Pen SatrG640 Drawing Tablet is compatible with most operating systems such as the Windows 7/8/10 and Mac OS 10.8 and above. 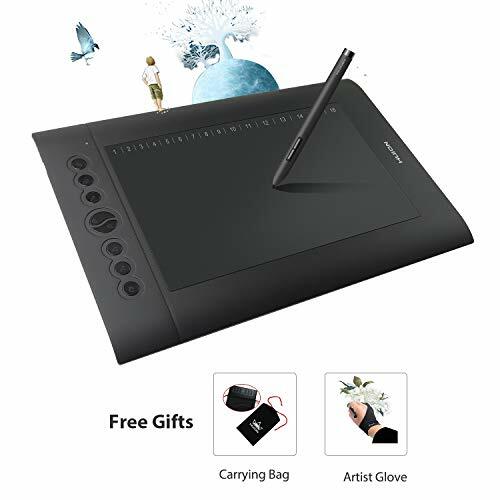 In addition to that, this tablet allows you to use major drawing and painting software such as Photoshop, Clip Studio, SAI, and Painter among others. Pros: This drawing tablet uses the latest XP-Pen drivers that are extremely easy to install. The process is very simplified as it requires you to remove the old drivers and simply download the latest ones automatically. When it comes to using the pen, both left and right-handed users will not need to switch the pen as it’s already designed to work on either hand. The XP-Pen SatrG640 Drawing Tablet is designed to be used in all categories whether it’s drawing, sketching, writing, painting or taking signatures. This tablet is perfectly suited to beginners aspiring to become professional digital artists. Its light, sleek and feature-packed meaning you can use it almost anywhere. This drawing tablet is convenient and very responsive. It has a pressure sensitivity of 8192 levels and a report rate of 266 RPS. Cons: Although this drawing tablet has an elegant appearance, XP-PEN failed to add the control buttons on the tablet making things a little bit complicated for most users. With a thickness of just 2mm, this drawing tablet is considered to be too thin and susceptible to breakage especially if you place something on its top. You’ll therefore need to be very careful when handling it. From what we’ve seen, I will personally recommend this drawing tablet to all beginners or any graphic designer searching for a budget drawing tablet. However, if you have some bucks to spare, I would recommend you to buy a much bigger drawing tablet that will provide you with a wider working area. 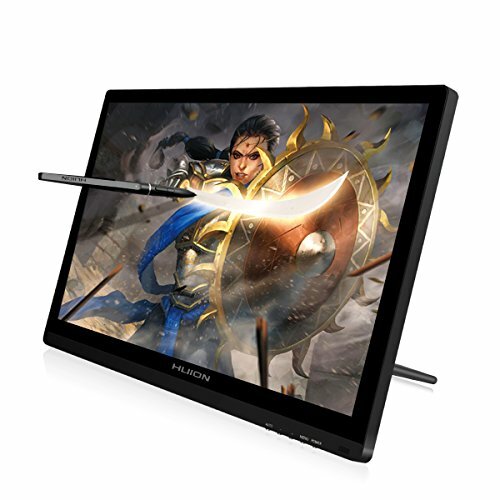 Other than that, the XP-Pen SatrG640 Drawing Tablet can’t be overlooked especially if we consider the many features and benefits its set to offer to all drawing and gaming enthusiasts. Next, in this guide, we have the Huion H610 Pro Drawing Tablet. If you’re searching for a bigger alternative that will provide you with more drawing space, then this tablet will definitely suit your desire. Designed with a wide working area that measures 10×6.25 inches, I don’t think you’ll have anything to complain about here. For efficiency, users are given the option of creating their own shortcuts (up to 8) while still taking advantage of the digital rechargeable pen (PEN80) that offers you a maximum of 350 working hours. When it comes to the level of accuracy, this tablet offers you pressure sensitivity levels of 8192, a screen resolution of 5080LPI and a report rate of 233 RPS. Designed to work with most popular Windows and Mac OS operating systems, the Huion H610 Pro Drawing Tablet is what you need if you’re a professional or an aspiring graphic designer out there. Features: one of the smartest features of the Huion H610 drawing tablet is the size of the drawing area. Measuring 10×6.25 inches, the drawing area is considered to be wide enough to fit most of your drawings. 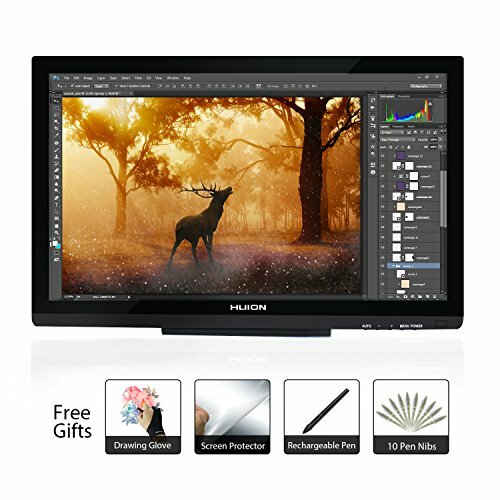 When it comes to compatibility, the Huion H610 Pro Drawing Tablet is considered to be more advanced and compatible with major operating systems such as Windows 7 and higher and Mac OS 10.11 and higher. Speaking of accuracy, the Huion H610 Pro Drawing Tablet has a pen pressure sensitivity of 8192 levels and a report rate of 233RPS. With such a high-efficiency level, drawing and painting will be much easier than ever before. Pros: The Huion H610 Pro Drawing Tablet is designed with 8 defined shortcuts that are displayed in small icons on the side of the tablet. The rechargeable stylus is light and perfectly built. It comes with a pen holder which can be detached to reveal 4 dedicated replaceable nips. The Huion H610 drawing surface of this tablet is almost the size of an A5 paper only that it’s a little bit wider. With a pen pressure sensitivity of 8192 levels, the stylus is basically sensitive and more accurate than most of its competitors. The Huion H610 Pro Drawing Tablet has an outstanding software support feature that lets you work with the latest versions of Windows and Mac OS operating systems. Cons: One issue with this drawing tablet is installing the drivers. Most customers have complained of how difficult it was to install the drivers and get the tablet back in its working order. Finally, the Huion H610 Pro Drawing Tablet is a budget tablet that offers premium features only available in those high-end alternatives. Designed with a wide working surface, a rechargeable pen, and 8 dedicated shortcut options, this drawing tablet is efficient and perfect for those users looking forward to advancing their graphic design skills without digging deep in their pockets. Huion has once again hit the jackpot by introducing another innovative drawing tablet that will surely revolutionize the graphic design industry. Featuring a wide 19.5” LCD display, this drawing tablet is designed to give you a superior drawing and painting experience thanks to the 1920×1080 HD resolution, a contrast ratio of 3000:1 and a color display of 16.7 million pixels. To advance user experience, Huion has fitted the Huion KAMVAS GT-191 with two pens that offer a pressure sensitivity of 8192 levels and a report rate of 233RPS. To make your drawing even more professional, this drawing tablet has an adjustable stand that easily adjusts at an angle of 20° to 80°. Designed with a lightweight of just 13.05 pounds and sleek dimensions of 18.7×11.7×1.4 inches, the Huion KAMVAS GT-191 is an innovative drawing tablet you can’t miss to own in 2018. Features: one of the most remarkable features of the Huion KAMVAS GT-191 is the quality of the screen. Designed with a wide 19.5” display, this screen is able to give a clear view of whatever you’re drawing thanks to the 1920×1080 HD resolution, a contrast ratio of 3000:1 and a color display of 16.7 million pixels. Like it’s not enough, Huion has gone ahead to include two more pens that will give every user a premium feel when drawing. The pens have a pressure sensitivity of 8192 levels, a report rate of 233 RPS and a resolution of 5081LPI. 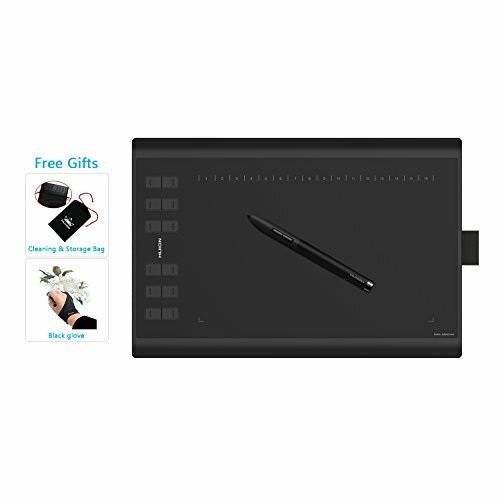 To add to the numerous benefits offered by this drawing tablet, Huion has included all the necessary connection ports to this drawing tablet such as the VGA, USB, HDMI, and DVI ports. Pros: If you’re a video or image editor, the Huion KAMVAS GT-191 drawing tablet is probably the best gadget for you thanks to the wide 19.5 inch screen with a resolution of 1920×1080 HD. The base of the Huion drawing tablet is made of rubber that helps to keep it sturdy when drawing is in progress. In case you’re not comfortable with that, you can take advantage of the stand to adjust the tablet to your desired angles. To guarantee you maximum accuracy and unmatched performance, the Huion GT-191 comes with an advanced stylus that’s light, comfortable, and very reliable offering a pressure sensitivity of 8192 levels and a report rate of 233RPS. When making your purchase, customers will have a chance to enjoy a wide range of components that include; a smart guide, USB, HDMI and AC cables, a power adapter and some free gifts. Cons: One of the major issues with the Huion drawing tablet is poor pen accuracy. When drawing, the cursor seems to be several millimeters away from the pen tip making things quite difficult for you. To correct this, you have to calibrate the pen multiple times. A number of customers have complained of the quality of the pen color display. Although you may try to calibrate the colors, they still appear to be faded with washed-out-effects. Overall, the Huion KAMVAS GT-191 drawing tablet is a smart option for armatures or beginners in the graphic design industry. The Huion wide display, the pen quality and the multiple accessories are some of the brilliant features most users will enjoy. However, following a serious concern about the pen accuracy, I think this drawing tablet will be limited to only armatures but not professional artists as you’ll have to struggle a lot when calibrating the pen. Our review can never be complete without naming the Huion New 1060 Plus Graphic Drawing Tablet. A big name in the graphic design industry, this drawing tablet allows you to draw, paint and conduct other graphic tasks without feeling interrupted. To begin with, this tablet provides you with a wide 10×6.25 inch active area where you can draw or paint large characters without running out of space. The pen is quite responsive with a pressure sensitivity of 8192 levels. When it comes to the memory status, this drawing tablet will offer you a massive 8GB memory card that will allow you to save your work much easily. When it comes to the functionality, the Huion New 1060 Plus Graphic Drawing Tablet has included 16 soft keys at the top and 12 physical express-keys on the left that make drawing much easier and more customizable. In addition to that, this drawing tablet is compatible with major Mac and Windows operating systems as well as most popular drawing software such as Adobe Photoshop, Corel Painter, Clip Studio and Zbrush among others. Features: one of the major selling points of this drawing tablet is the massive working area. Designed with an entire 10×6.25 inch full active space, most artists will surely enjoy working with such a tablet as it provides you with enough room to conduct all your drawing tasks. Although the Huion pen is quite similar to most of the older Huion models, the high-pressure sensitivity of 8192 levels gives it an improved accuracy that makes drawing and painting much easier than ever before. In addition to that, the pen comes with a holder and a charging USB cable that makes it quite easier for you to recharge and use the pen for longer hours. Moving on, the Huion New 1060 Plus Graphic Drawing Tablet comes with a massive 8GB memory micro-SD that makes it both easier and convenient for you to transfer your artwork to a computer. The memory card can be upgraded to 64GB to suit professional graphic designers who need to transfer bulky drawing assignments. Pros: One of the benefits of the Huion drawing tablet is its lightweight. At just 3.2 pounds, this tablet is considered to be extremely light and very easy to carry. To give an exclusive user experience, this tablet comes with multiple accessories that include; a carrying bag, a micro-SD card, USB cables, a Cura Glove, a pen stand and a rechargeable pen. 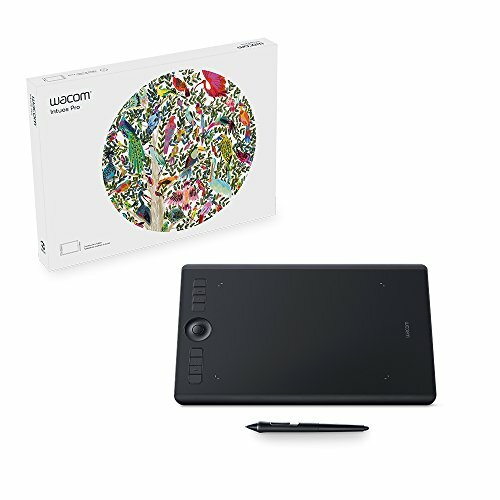 This tablet comes with a massive 8GB memory card that makes it easier for you to save your artwork and transfer it to your computer without any interference. The Huion New 1060 Plus Graphic Drawing Tablet is compatible with major Windows (7 and later) and Mac OS (10.11 and later) as well as major drawing software such as Adobe Photoshop, Manga Studio, Zbrush, Illustrator and Krita among others. Cons: Although this drawing tablet has everything you would have dreamt of, the pen keeps freezing when drawing making things a little bit difficult for you. According to the majority of the users, the drivers are quite difficult to install and reinstall. You have to switch the USB ports before you can successfully reinstall them. Overall, the Huion New 1060 Plus Graphic Drawing Tablet is an affordable tablet that packs more features as compared to most of its competitors. Designed with a huge active surface, a rechargeable pen, a lightweight and numerous shortcut keys, this tablet is easy to carry, easy to operate and works perfectly when combined with either an Mac or Windows computer running the latest operating systems. Finally, in our review, we have the Wacom Intuos Pro Digital Drawing Tablet. If you’re a professional graphic designer, digital artist, or a digital designer, this drawing tablet is definitely a must-have. Although it’s quite pricey than most of the tablets we’ve reviewed here, the Wacom will definitely take your skills and drawing abilities to a top-notch level. To start off, this tablet comes with the latest pen technology that supports a pressure sensitivity of 8192 levels. The pen is accurate and highly responsive and doesn’t have any lag time when drawing is in progress. Although this tablet is light and super slim, the manufacturer has included a large 8.7×5.8 inch active area where you can make your drawings. When it comes to the compatibility, the Wacom Intuos Pro Digital Drawing Tablet is compatible with major operating systems such as Windows 7 and later and Mac OS 10.10 and later versions. For an easier file transfer, Wacom has added a wireless connectivity via Bluetooth where file transfer and drivers’ updates can be connected much easily via your laptop or Smartphone devices. Features: one feature that makes up a perfect drawing tablet is the active area. With this factor in mind, Wacom has managed to design their tablet with a wide active area measuring 8.7×5.8 inch to give you the amount of flexibility you’ll require when drawing. Apart from the drawing area, there’s the intuitiveness of the tablet. To make it easier for you to navigate through the settings and the menu, Wacom has included express keys and a touch ring with a firm gradual depression. The Wacom Intuos Pro keys are easy to press and perfect for navigating through the shortcuts. Speaking of the pen, Wacom has managed to design an exceptional tilt-response pen (the Pro Pen2) that supports a pressure sensitivity of 8192 levels. The pen comes with a pen holder, 10 replacement nibs and a dedicated nib remover. Finally, we have the Bluetooth and the compatibility advantage. Unlike its predecessors, the Wacom Intuos Pro Digital Drawing Tablet supports the latest Windows (7 and later) and Mac OS (10.10 and later) operating systems making it highly usable in most computers. The Bluetooth feature lets you connect wirelessly to your devices without having to use the cords. Pros: The Wacom Intuos Pro Digital Drawing Tablet is a sleek light tablet that suits most professionals especially in the field of architecture and interior design. When it comes to the control settings, the Wacom Intuos Pro tablet comes with express keys and a touch ring that allows you to adjust the settings much easily. The pen itself is highly advanced with the latest technology. It has a pressure sensitivity of 8192 levels and comes with a pen holder and 10 replaceable nibs. The Bluetooth technology is another major selling point as it allows you to connect with other devices wirelessly thus eliminating the need to use multiple cords and cables. The Wacom Intuos Pro Digital Drawing Tablet has a wide active area and is compatible with major operating systems such as the latest Mac and Windows OS versions. Cons: The working area is quite rough as compared to most other drawing tablets. This means that you’ll have to use a higher quality nib over the standard ones. Some customers have complained about the nibs which they say are cheap and quite flimsy. They sometimes fall off and need to be pushed back when you’re drawing. Another major concern is the weird bugs which most customers have said are quite annoying. One of them is with the pen which fails to work forcing you to restart the drivers every time. Other than the few issues mentioned above, the Wacom Intuos Pro Digital Drawing Tablet is definitely a must-have gadget if you’re really looking forward to advancing your drawing and painting needs. Feature-packed with some of the most advanced features, this tablet is not only sturdy, but it’s also super light and compact enough to carry almost anywhere. The next time you go looking for a reliable tablet for your graphics needs; don’t fail to put the Wacom Intuos Pro Digital Drawing Tablet in your Wishlist basket.